Time is running out for tainted former Finance & Home Minister Palaniappan Chidambaram. 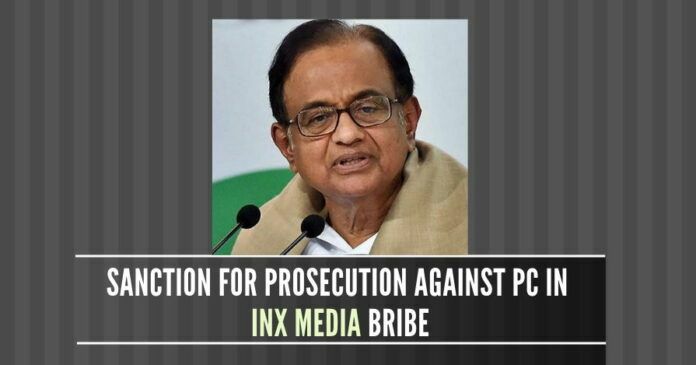 Tightening the noose around the corrupt former Minister, the Government gave nod to the Central Bureau of Investigation (CBI) to Sanction to Prosecute P Chidambaram in the INX Media bribery case. CBI is expected to file chargesheet against Chidambaram, his son Karti and some senior officials in the Finance Ministry soon for blatant violations in granting illegal post-facto clearance to INX Media’ promoters Peter and Indrani Mukerjea in 2007. The Enforcement Directorate (ED) has already attached Karti and his firms’ Rs.54 crore-worth properties in Delhi, Ooty, London and Spain. The market value of these properties is expected to be more than Rs.300 crores. The CBI, in February 2018, arrested Karti in a surprise move, when he landed from London. Sensing danger, Chidambaram immediately approached Delhi High Court and obtained interim protection from arrest. In November, Centre had given Sanction to Prosecute Chidambaram in the Aircel-Maxis case. The INX Media bribe was caught by ED’s Joint Director Rajeshwar Singh, during their joint raid with Income Tax in Chidambaram’s home and Karti’s firms in December 2015 in connection with the Aircel-Maxis probe. The raid had exposed Chidambaram family’s illegal assets in 14 countries and 21 undeclared foreign bank accounts. PGurus in an article titled as ‘Chidambara Rahasya’ detailed these illegal properties in 14 countries and 21 foreign bank accounts. As per the CBI’s First Information Report (FIR), in 2007, INX Media got a Foreign Investment Promotion Board (FIPB) clearance to accept Rs.5 crores as Foreign Direct Investment (FDI). Income Tax then found that INX illegally accepted Rs.305 crores and issued a notice to Peter and Indrani, promoters of the TV channel. After getting the notice from Income Tax, the promoters approached Chidambaram and Karti and paid bribes amounting to around Rs.5 crores. The kickback was routed to Karti’s firms Advantage Strategic Consulting and Chess Management Services. After son confirmed receipt, the FIPB headed by Chidambaram issued an “illegal” post facto clearance to INX Media to accept Rs.305 crores. This was a blatant violation to save the firm from the Income Tax’s prosecution, said CBI. The CBI, in February 2018, arrested Karti in a surprise move, when he landed from London. Sensing danger, Chidambaram immediately approached Delhi High Court and obtained interim protection from arrest. The CBI and ED also approached the High Court demanding custodial interrogation of Chidambaram and the previous week, Delhi High Court has reserved the matter for orders. The High Court’s Single Bench headed by Justice Sunil Gaur is expected to pass the order this week. The ED also found that Rs.5 crore-bribe was extended to Rs.54 crores business by Chidambaram family. In October 2018, ED attached properties in Delhi, Ooty, London and Spain. He should be given the same treatment meted out to Sadhvi Pragya & Lt Col. Purohit. Then he will understand the human values. चिदंबरम कब सरकारि मेहमान बनेगा? २०१९ लोकसभा चुनाव के पहले या तुरंत बाद? When will Chidambaram become ‘Tihar’s Guest of Honour’ ???!!! Prior to LS-2019 Elections or immediately after? Why did AG travel with a smuggling case accused?